Ocean River Institute display to come down and depart Harvard Square. 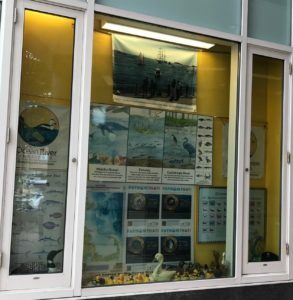 Last week, while I was sailing on the tall ship Europa from Newfoundland to Nova Scotia, I was informed by email to remove the Ocean River Institute’s exhibit in the display window by the Mt Auburn Street Post Office in Cambridge. When I was hauling on halyards, I was directed to clear away the ducks and ocean images from the streets of Cambridge. I was up to date on monthly payments. However, after many years of occupancy, the last display window contract of eighteen months had expired during the winter. And now someone else is interested in the space and likely had agree to pay more rent per month. 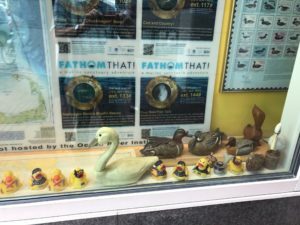 The Ocean River Institute display window is a Harvard Square amenity. Inside the post office I over hear Dads saying: “after we finish with all this, then we’ll go see the ducks.” Once I found a woman looking intently at the one of the fish sketches by Dina Chapeau. She was France and wanted to know what we called monkfish so she could order it off a menu. The irony is we were all introduced to monkfish by Julia Child, who discovered it in France. I like the monkfish served at Parsnip on Winthrop. Watercolors by Harper Dangler illustrate three ecotones, the Atlantic Ocean, Estuary and Coldstream River. At the bottom of the ocean may be seen four habitats, muddy, sandy, gravel and boulder reef. Each ocean floor has its own inhabitants who are identified by Dina’s legend on the right. For me the most poignant image is up high on the wall. A vibrant and clean Boston Harbor with cat boat, tug boat, tall ship and people lolling about on the harbor walk. Across the bottom of the harbor image is written: Together, we are protecting environments not for self but for all. When we’ve got a harbor of pride with marvelous animals dwelling within, it should be displayed. Must the amenity on Mt Auburn Street by the Post Office be gone because of a lapsed contract? Three times I’ve traveled across the codfish gray seas of Georges Banks, about 150 miles southeast of Nantucket, out onto the Mediterranean blue of Oceanographer’s Canyon. Every time we saw sperm whales surface, blow a spout that arched diagonally to the whale’s left, and dive. One time we found a dead whale floating on the water likely killed by a ship strike. This wondrous ocean realm is in great need of better management. In 2016 President Obama did just that. He created the NE Canyons and Seamounts Marine National Monument. He left for posterity a legacy that portends to be as great as President Theodore Roosevelt creating the Grand Canyons National Monument in 1908. While eagles soar over the infamous Arizona canyons, sperm whales dive the cold water coral canyons of the Atlantic Ocean. The trouble is the current president has requested reports be made on the “lost opportunity costs” of having a national park area instead of letting industry cash in on more lucrative enterprises such as oil and gas drilling. Most precious of all is a high-tech metal found in rare earth minerals, tellurium. Due partly to its high atomic number, this element is rarer than gold or platinum, and it’s in more demand. Tellurium when combined with bismuth becomes an alloy that is used by Intel for the fastest phase change memory chips. When tellurium is combined with cadmium the result is the alloy with the greatest efficiencies for solar cell electric power generation. In the Atlantic Ocean off the continent, four seamounts rise up from the ocean abyssal floor, Bear Seamount (3,615 ft), Physalia Seamount (6,062 ft), Retriever Seamount (5,967 ft.), and Mytilus Seamount (7,444 ft). Each has its own unique assemblages of animals. The craggy peaks are gnarly with black basalt. This volcanic rock is very porous and soaks up rare earth minerals from seawater. Over the millennia a crust is formed rich in tellurium. Tellurium is mined from ancient seamounts in the mountains of China. China will not permit the export of tellurium forcing companies to manufacture solar cells and computer chips in China. The solar cell industry was looking to New England’s seamounts when Obama wisely went around Congress to create the monument. He forced the industries to look instead to recovering tellurium from discarded solar panels and computer boards, as a company in Belgium does, or to mine tellurium from Mountain Pass in California. While industries bellied-up to China’s tellurium mines, America’s only rare-earths mineral mine at Mountain Pass California filed for bankruptcy. No surprise, the winning bidder for America’s rare earth minerals mine has ties to the Chinese government. Unfortunately for the spectacular ocean places off of New England’s shores, instead of standing up to China like he promised in his campaign, President Trump would rather open up our four unique seamount ocean ecosystems to mining. The window of opportunity to comment on why the NE Canyons and Seamounts Marine National Monument is of greater value to our nation than is mineral mining or oil drilling will close on Wednesday July 26. Speak out for the protection of these sperm whale canyons and seamounts. We can find better ways to keep the glow on our screens and panels. Far out in the Atlantic Ocean, east of New York and Boston, beyond the continental shelf, beyond the deep sea canyons known as Hudson, Hydrographers, and Oceanographers Canyons, four seamounts arise ten thousand feet off of the abyssal sea floor: Bear, Physalia, Mytilus, and Retriever. Gnarly with much surface areas, seamounts are made of basalt rock with a remarkable porosity of 60%, a multitude of surfaces. This very hard extrusive igneous rock sponges out of seawater rare earth minerals (cerium, europium, lanthanum, and yttrium) and high tech metals (tellurium, cobalt, bismuth, zirconium, niobium, tungsten, molybdenum, platinum, titanium, and thorium). Standing deep in seawater for more than 40 million years, Atlantic seamounts have accreted onto fractal seascapes significant amounts of high tech metals. The mineral mining eye of the solar cell industry has turned to these four Atlantic Ocean seamounts. As part of the Northeast Canyons and Seamounts National Marine Monument these four seamount are protected. Yet, the current administration wants to close this ocean refuge, remove the marine monument, and release the wrecking ball of high-tech metal mining. This will destroy the unique assemblages of marine life living deep below the sea’s surface on Bear, Physalia, Mytilus, and Retriever Seamounts. Please make a donation in defense of these ocean realms. Current practices It is more expensive to use tellurium mined from ancient seamounts in China. China refuses to export their rare minerals, requiring the manufacturing of solar chips and next-generation computer chips to remain in China. Strip mining the seamounts will go unnoticed because the highest summits are still over 1,000 feet below the surface. It would be more regulated, create more jobs, and totally more expensive to mine tellurium from ancient seamounts in Sierra Mountains of California. And everyone must have cheap solar panels to save the planet while saving on utility bills and increasing consumption of energy. Mining seamounts for high tech metals may be good for the solar-cell industry. An industry receiving government subsidies. Mining seamounts is not good for fisheries, an industry without subsidies and much regulation by government. Mining seamounts is not good for the economies of coastal communities. Become a guardian of ocean realms defending ocean communities, acting for healthy oceans. Please make a donation in defense of ocean realms and join with the Deep Sea Canyon Rangers. 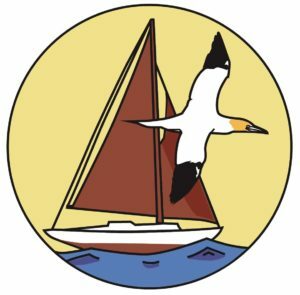 On Tuesday, February 7, when wind driven snow slashed across the bay, in Plymouth the fate of a small silver fish and a fishery was being decided at a meeting of the New England Fishery Management Council’s Herring Committee. The room was packed. The council was deep into Amendment 8 to the Atlantic Herring Fishery Management Plan. More than the aisle between the rows of chairs separated the audience. Overflowing out into the hallway were herring fishermen. On the other side, were charter boat operators, striped bass and bluefish fishermen, anglers, watershed groups, and conservationists. I was of the latter group and saw the problem as recognized by Amendment 1: “significant damage to a keystone species like herring could result in long-term and possibly irreversible damage to many other components of the…ecosystem.” The keystone species of great importance to me are the river herring (bluebacks and alewives). So why had I traveled far for a sea herring (different species) meeting on the icy shores of Plymouth harbor? Coastal communities have improved river conditions for alewives, blueback herring, and shad since 1976 when fishery regulations were first passed. 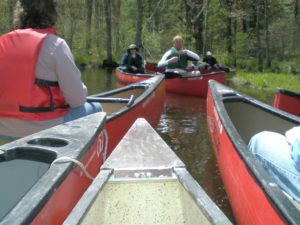 Watershed associations worked with state and federal agencies. Dams were removed; fish ladders, pools and ripple areas built, and shade trees planted. $8 billion has been spent by government improving river conditions for herring. Often, private investments have matched government spending. Anglers and others have invested in the game fish that forage on herring. Yet, despite all the efforts to restore river herring, there is mounting evidence that blueback herring populations may have dwindled to threatened status. The biggest fishing ships in New England waters are the “mid-water trawling” vessels that reach 160 feet in length. They set massive nets six stories high. One set of the trawl can haul in 800,000 pounds of fish. The problem is a matter of scale where one misplaced trawl could destroy the entire population of one river’s herring. All the millions spent on that river’s herring could be for naught when a herring population does not return because they have been pulled from the ocean, a most final trawl. Unfortunately, the fishery amendment only offers alternatives that prohibit mid-water trawlers from fishing from 6 to 50 nautical miles from shore. Trawlers with different gear types, such as large bottom trawlers, also catch a ton of river herring that they dump at sea. This was a concern last year when small mesh bottom trawlers nearly 150 feet in length hoovered inside of Narraganset Bay. Significant biological and ecological impacts can be caused by intense fishing. Associated marine life may be harmed, particularly predator fish and marine mammals that must leave the area to find food and other animals such as river herring that are caught as bycatch. I called on the fishery council to take the precautionary approach in amending the herring plan, to support year-round closures to mid-water trawlers extending 50 miles from shore. This is the only alternative under consideration that protects all identified river herring hotspots. Don’t overfish our silver darlings! The South Florida Water Management District has begun a process to revoke the agreement between the State of Florida and the U.S. 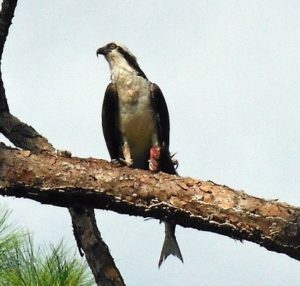 Fish and Wildlife Service to eliminate The Arthur R. Marshall Loxahatchee National Wildlife Refuge. No surprise, the Refuge was created to stop the sugar industry dumping waste. The U.S. Department of Justice has enforced water quality laws and ordered sugar industries to clean up their spoils. Join with us in calling on Governor Scott to stop the Florida agency from revoking the license agreement. The U.S. Fish & Wildlife Service has met all aspects of the agreement, except for the eradication of Lygodium, an invasive climbing fern. Loxahatchee comes from the Seminole meaning “River of Turtles.” The Loxahatchee National Wildlife Refuge is a mosaic of wet prairies, sawgrass ridges, sloughs, tree islands, cattail communities, and a 400-acre cypress swamp. The refuge provides essential wildlife habitats for King Rail, Limpkin, Fulvous Whistling-Duck, White and Glossy Ibis, Sandhill Crane, threatened Wood Storks, and endangered Everglade Snail Kites – home for 250 species of birds and two turtles, Peninsula Cooter and Florida Softshell. See what others are saying both in the neighborhood and far, far away about how vital the Loxahatchee is. Add your voice and perspective to the chorus by commenting below. Please include your name, town and state because the Loxahatchee NWR belongs to all of us. Give for turtles not forgotten.